Home Cures exclusive GREEK style Therapeutic Bracelet with Far Infra Red and Negative Ion Elements, our clients report, SOOTHE Muscular and Joint Pain, LIFT your Morale and Well Being whilst AIDING to harmonise your BODY RHYTHM and BOOST POSITVE ENERGY. The Greek "Key" Symbol is recognised as representing Eternal Life, Love and Friendship. Our very effective Greek style offers another benefit - "Eternal" help for Depression, Stress, Pain and Wellbeing. This bracelet has no magnets, so can be used by pregnant and breastfeeding ladies as well as those wearing heart pacemakers, after consultation with their medical adviser, for the help of relief of pain and improvement of well being. I have worn this bracelet for 1 month now. If I do not wear it my pain comes back. If I take it off the "ants in my fingers" feeling comes back. I find that this "Greek" style is more effective and its effect is quicker. I feel an incredible benefit which I simply cannot ignore; my algo-dystrophie (a severe form of arthritis) is so much better that I have now started back to work. Mme.C.F Dept 60, France. Home Cures "Greek Style" Therapeutic Bracelet comes in various sizes and offers far more than just simple copper or any leather version. Highly attractive and inexpensive, our bracelets can offer you very important benefits. 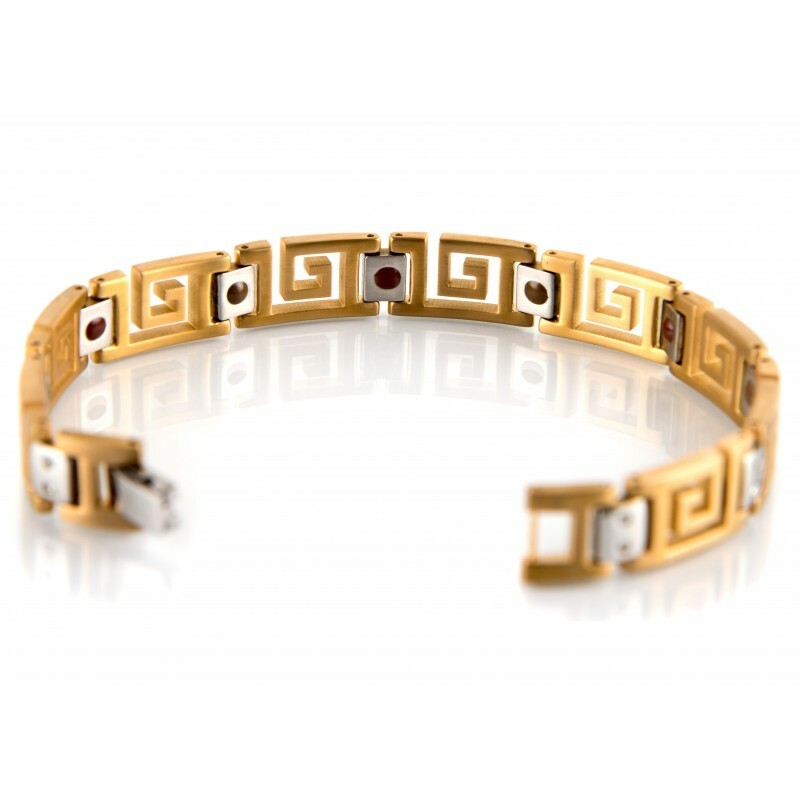 Home Cures "Greek Style" BRACLETS can help you live a better, more comfortable life. 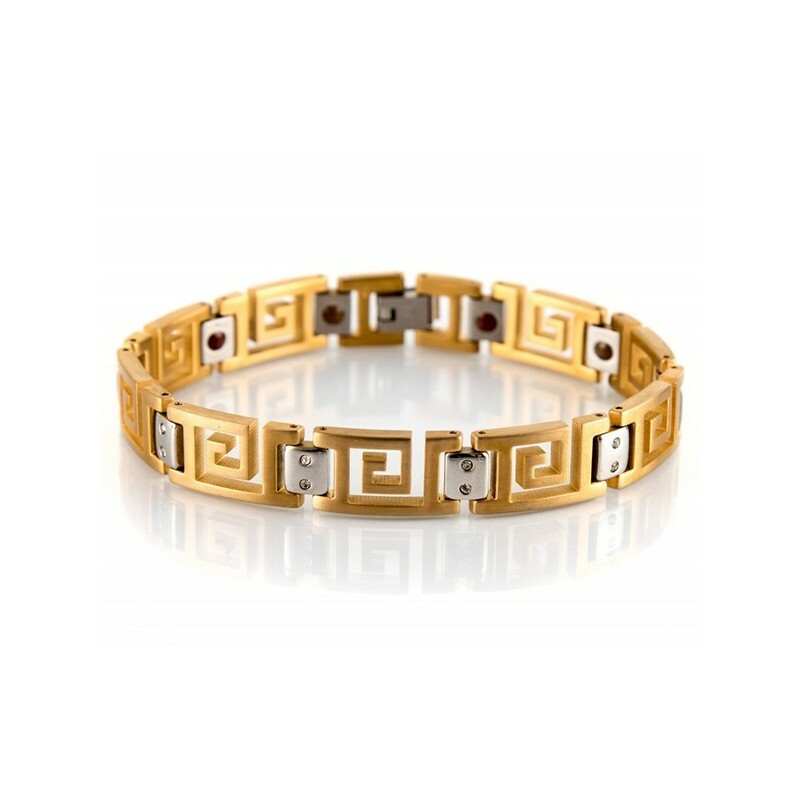 Made from specially treated, Jewellery quality, Gold plated Stainless Steel, Home Cures Greek Style Therapeutic Bracelets have set into the links Far Infra Red elements (Coloured red) and Negative Ion elements, (coloured brown). All our Gold Plating is of the highest jewellery quality. * NEGATIVE IONS have the possibility to COUNTERACT DEPRESSION and DIMINUE STRESS whilst at the same time BOOSTING YOUR ENERGY. 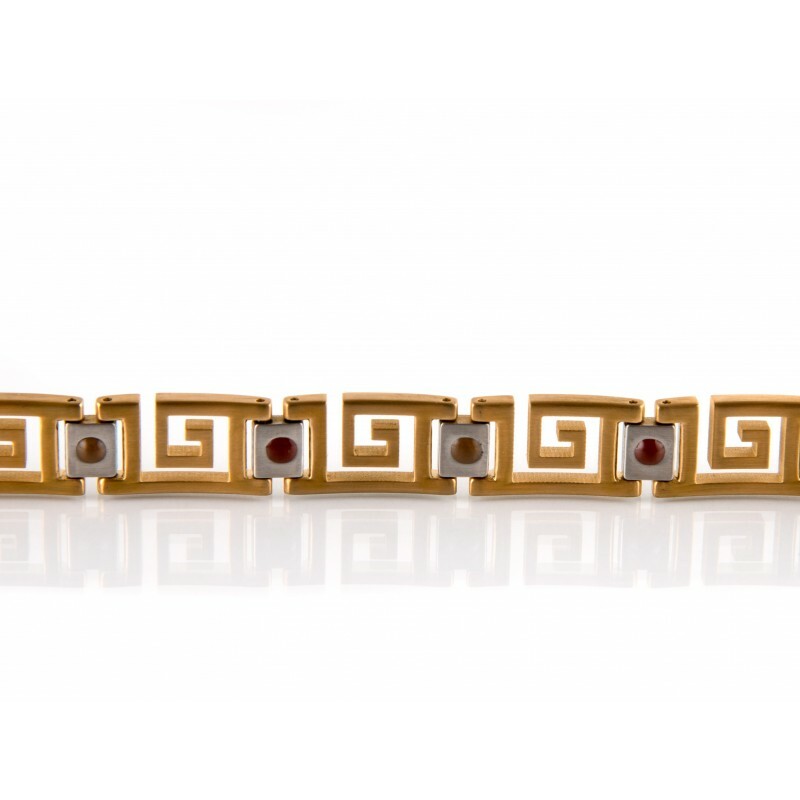 This very attractive and distinctive GREEK style - with more soon to be introduced - Home Cures Therapeutic Bracelet is the ideal gift for anyone. We have three standard lengths : - 21 cms 19 cms 17 cms. Please state your wrist circumference on ordering and we will supply you with that length + 1 cm (depending on link size). Each bracelet is supplied in a luxurious veleveteen pouch. Be the envy of everyone - wear your Home Cures Bracelet and enjoy the benefits. "I have wonderful news for you! I have worn the bracelet for three days now and I no longer have my back pain which i have suffered for years. I hope that it lasts! I think that this bracelet is really something." Mme. M.P Dept 88, France. Please note: It is advisable to wear Home Cures Therapeutic Bracelets, or any similar, for only a few hours at first until you become accustomed. It is recommended that you take it off at night. 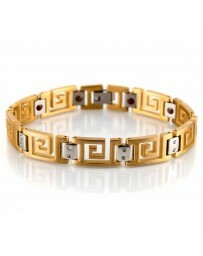 Our Greek Key style bracelet may be worn by almost anyone. However, if you are pregnant, have a heart pacemaker or take special medication for the treatment of blood disorders or if you are in doubt, please consult your medical adviser.